On the 9th (Mon), steep yourself in history at Clock Tower (Tokei-dai), tour the pleasant surroundings at Odori Park, then take in the architecture and design of Hokkaido University Sapporo Campus, and finally contemplate the waterfront views at Otaru Canal. Get ready for a full day of sightseeing on the next day: pause for some photo ops at Statue of Pioneer Mother, get great views at Sapporo TV Tower, take a stroll through Susukino, then get a sense of history and politics at Former Hokkaido Government Office Building, then get into the urban bustle at Sapporo Underground Pedestrian Space, and finally enjoy breathtaking views from Sapporo JR Tower Observatory T38. Use Inspirock's suggestions to plan your Sapporo trip and find the best activities and attractions for your vacation. Singapore, Singapore to Sapporo is an approximately 11-hour flight. You can also do a combination of bus and flight; or do a combination of flight and train. The time zone difference when traveling from Singapore to Sapporo is 1 hour. Prepare for cooler weather when traveling from Singapore in December: high temperatures in Sapporo hover around 0°C and lows are around -2°C. Finish your sightseeing early on the 10th (Tue) to allow enough time to take a train to Asahikawa. Kick off your visit on the 11th (Wed): admire nature's wide array of creatures at Asahiyama Zoo, then get in on the family fun at Asahikawa Ramen Village, and then get engrossed in the history at Hokuchin Memorial Museum. For other places to visit, ratings, traveler tips, and other tourist information, read our Asahikawa trip planning site . Traveling by train from Sapporo to Asahikawa takes 1.5 hours. Alternatively, you can drive; or take a bus. In December, daily temperatures in Asahikawa can reach -2°C, while at night they dip to -5°C. Finish your sightseeing early on the 11th (Wed) so you can drive to Noboribetsu. 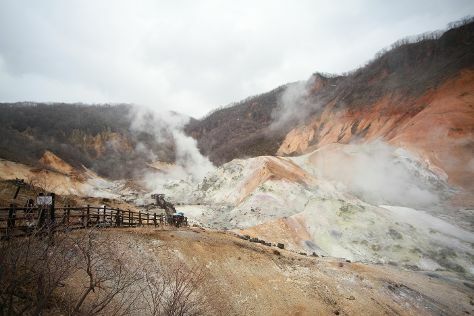 On the 12th (Thu), meet the residents at Noboribetsu Marine Park Nixe, then explore the striking landscape at Jigokudani, then witness a stunning natural landmark at Oyunuma, and finally soothe aching muscles at some of the top local wellness centers. To see where to stay, ratings, maps, and other tourist information, read our Noboribetsu trip planner . You can drive from Asahikawa to Noboribetsu in 3 hours. Alternatively, you can take a train; or do a combination of bus and train. When traveling from Asahikawa in December, plan for somewhat warmer days and about the same nights in Noboribetsu: temperatures range from 3°C by day to -1°C at night. Cap off your sightseeing on the 12th (Thu) early enough to go by car to Hakodate. On the 13th (Fri), take in the awesome beauty at Mount Hakodate, don't miss a visit to Hachimanzaka, then take in panoramic vistas at Goryokaku Tower, and finally admire the striking features of Goryokaku Park. To find reviews, ratings, other places to visit, and tourist information, use the Hakodate trip itinerary planning website . Getting from Noboribetsu to Hakodate by car takes about 2.5 hours. Other options: take a train. In December, daytime highs in Hakodate are 3°C, while nighttime lows are -3°C. Wrap up your sightseeing by early afternoon on the 14th (Sat) to allow enough time to travel back home.